Great! Happy Memorial Day to you to, Katie. This is an awesome graphic! Great picture. Enjoy the day. What a fantastic picture. Have a great holiday weekend! Excellent post!! Have a great Memorial Day weekend!! Great picture. I see everyone is wishing you a Happy Memorial Day but Memorial Day isn't really a happy day, is it? Gob bless and thank you to those and their families that served and sacrificed their lives so our country could be the great nation that it is. 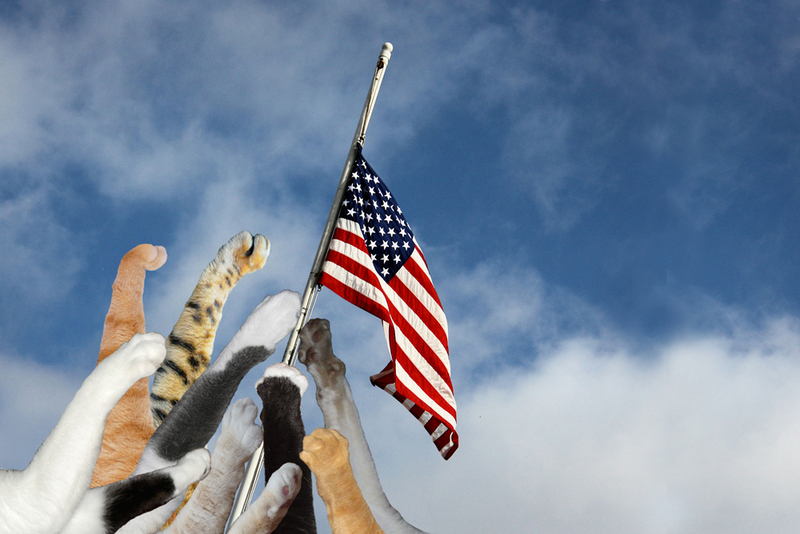 Just the purrfect posting for Memorial Day. ps: I just watched your video, and I think you were wrongly charged! Have a wonderful Memorial Day with your Peeps, Katie. That's a great picture, Katie! Efurry Memorial Day, the Human a-members her Mom's brother who died in Korea. He was the Human's godfather, but she was only about three when he died so she doesn't really remember him except through stories. RIP, Uncle Dickie. What a great idea for the picture. Hugs all around. Happy Memorial Day. Still waiting for Arty come home. Love the picture Glogirly did for today.